The pure dark chocolate cake adorned with the creative swirls will pop out the hidden artistic side of yours. The glittery look and delectable taste are pure satisfaction to eyes and taste. The smooth and decorated look of the cake adds wonders to the day of the pretty lady who always pays attention to every single detail. The swirls of the cake depict the twists and turns of life and the smooth texture depicts the all the love of life. Have the bite of this cake and get lost in the different tastes of life. The artistic people who love spicing up the dull things are the reason of this cake. This beautiful outside and delicious inside cake are baked with flour, butter, sugar, eggs, chocolate, dark chocolate and lots of art. Eggless cake is also available and for this you have to click on checkbox button. All the layers of this cake are covered with rich melting chocolate and chocolate cream. The Delicious whipped chocolate cream is iced all over the cake. Top of the cake is adorned with the glittery swirls of chocolate and dark chocolate. Every bite of this cake is super tasty and utterly satisfying. Customizations are available. An extra charge will be charged for changes. Every person is an artist at their own level. This cake is an overwhelming surprise to all the lovely people in your life. 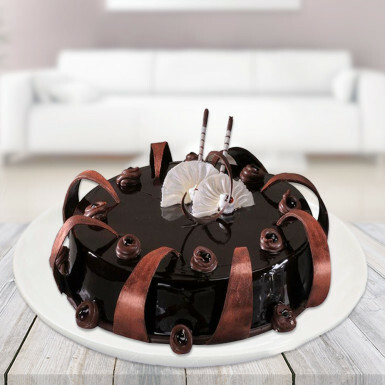 Order this cake and show your love cased in swirls of rich chocolate. This cake is perfect for all ladies who are particular about presentation. By ladies, we mean your mother who always told you to keep your surroundings clean, your teacher who told you to dress properly, your beloved or wife. Make their birthday’s, anniversary’s, success party, kitty parties more rocking.